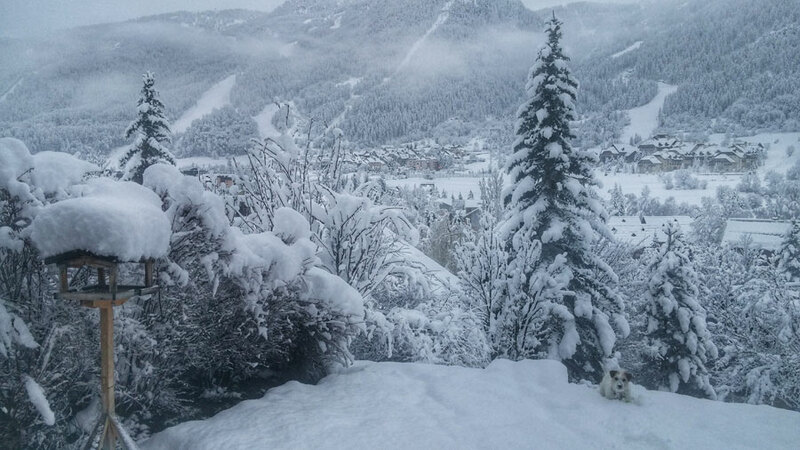 The ski blog featuring (almost) daily updates from the mountains with our Editor and Tech Editor and those other renowned powder hounds, The Rando Chiens. 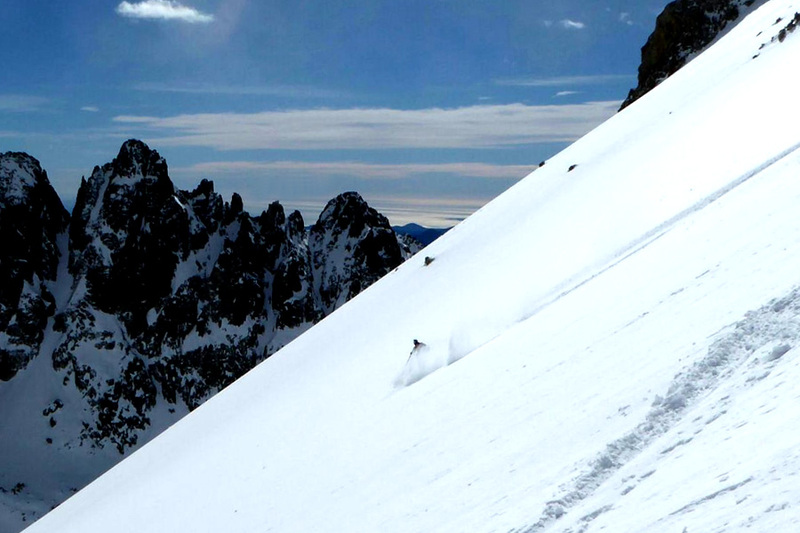 Catch our resort cruising, off-piste, backcountry, slackcountry, touring and exploring new destinations with reports on conditions, descriptions of routes and images. 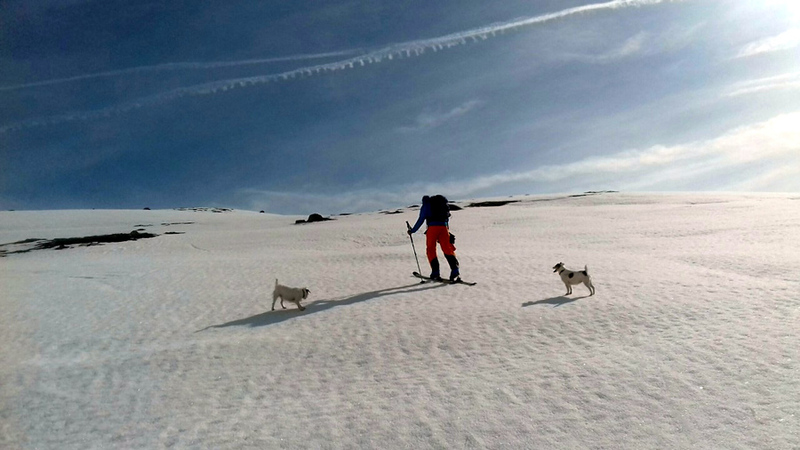 After a few days in sunny Blighty, I returned yesterday so the 'pack' was together again for ski touring - Gav, me and the Rando Chiens (aka the Jack Russells). So it was back up what, this season, has become one of our favourite ascents, 700m from the Granon road to the Gardiole. With the temperature not dropping below freezing overnight and light cloud in the morning it was debatable what the snow conditions would be? We left the van at 10am which seemed quite late but the clocks only changed last weekend (so it would have been 9am). 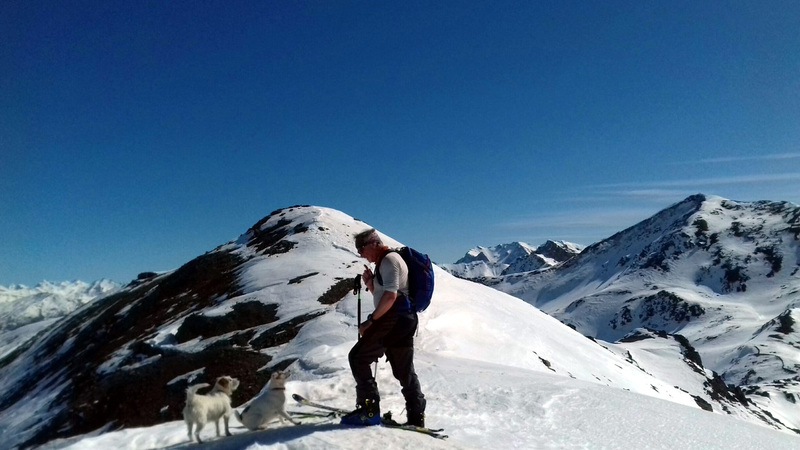 We did a leisurely climb up, taking photos and GoPro footage reaching La Gardiole in around two hours without having to put on crampons, overtaken up the last 50m by a rather fit ski tourer who turned out to be a mere 73 years old. Have been out on the bike past couple of days making the most of the uber warm temps and giving my ankle a rest from the ski boot. Day before yesterday I cycled over the Lautaret to La Grave, and back which was tough, and then yesterday up the Granon to see where the snow-line is, ready for a ski tour today. 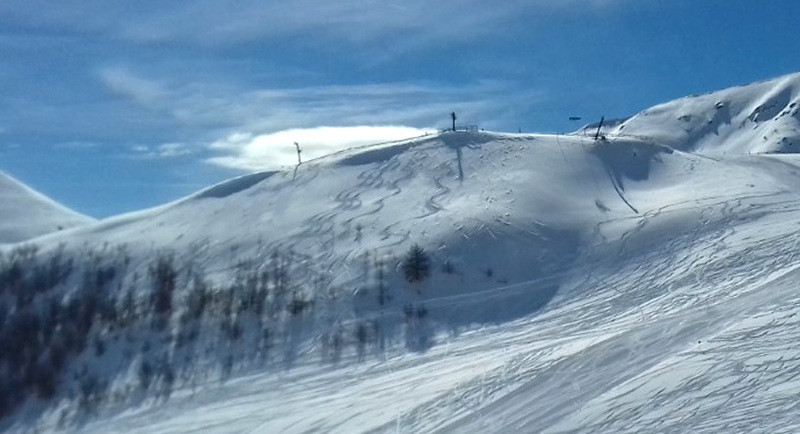 Arrived at the Frejus lift just before 09:00 and already a queue as the Casse du Boeuf chair was not yet running due to too much snow on the chairs, or some excuse along those lines. First off we lapped the Barres drag four to five times. Second run I bashed down the traverse track and at one point we had eight people (two groups) behind us taking advantage of my hard work, and all credit to them in that they skied the face keeping their tracks close leaving loads of untracked for further lines. Gradually around 10:30 as temps warmed up and the sun started to do its thing so the snow started to get heavy (we were being fussy) so one last line down through the untracked trees and out on to a lovely area above the Vallons before skiing back down to the chair. As we were going up the chair we decided against the traverse and off piste below Cucumelle as we knew that too would be getting heavy, and instead opted for the ridge hike as that would get us better powder that was not being affected by the rising temp and sun. Even though it was a Sunday there was hardly anyone else doing it and we were spoilt for choice as to which line to take, as you can see from the image below. Decided on one last run and this time hiked up nigh on all the way to take the steep line in-between the rocks, and that was superb! Late afternoon walked Les Chiens down to the Grotte and chilled in the sunshine with the usual suspects who were all stoked from the day. All that 35+cms of snow has now nigh on disappeared from the garden. Anyway at least up top will be good for touring mid week as the snow transforms to spring snow corn. It was raining in the valley pretty well all day yesterday and snow up the hill from around 2000m. A mate and I went up the Cibouit chair and then traversed across to try and locate the position of the ski I lost when caught in a slide a couple of months ago. I think we found roughly where it happened. When we joined the Tabac piste lower down I did suggest skinning back up as I thought the snow down the bottom would have been sparse and indeed it was with a mile or so walk out! 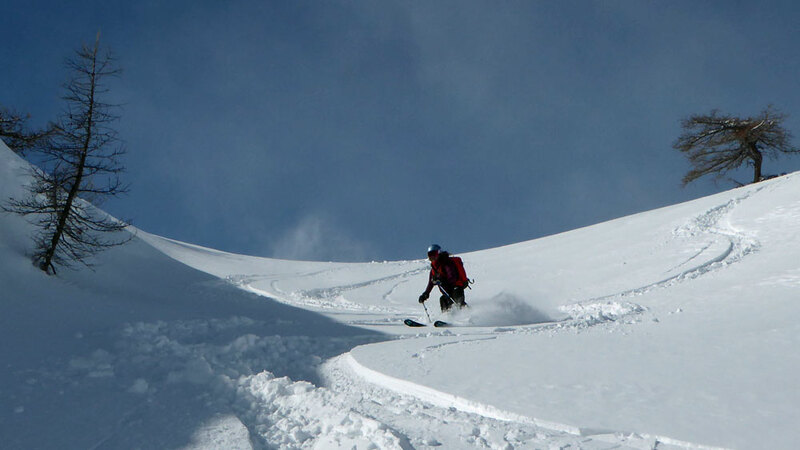 We skied everything from good powder to heavy knee wrenching slush as we neared resort. The rain started to turn to snow around 17:00 and by 18:00 there was a good cm or so and it carried on through the night and early hours. Temps in the valley are +1C so snow will compact down and will probably be gone in a couple of days. Meeting up at the Frejus at 08:50 - Watch this space. 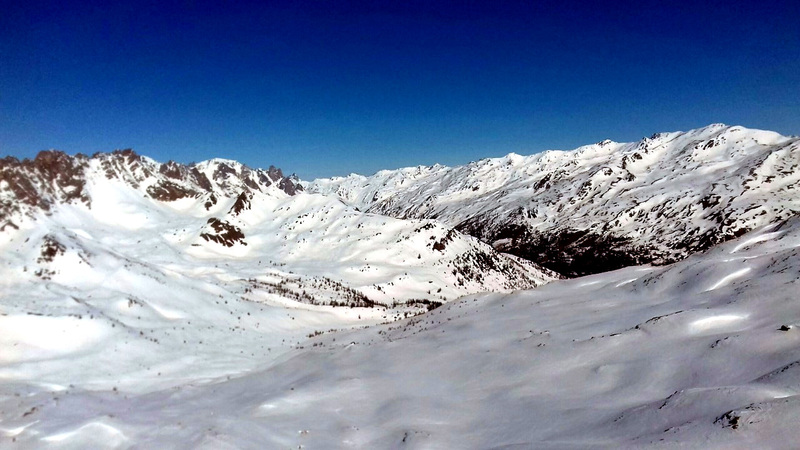 Mobiles were buzzing last night with plans for a ski tour, this morning, over the Grand Area up the Granon road. I understood from Ken that there would be seven of us including two other wives. So I was hoping for a mellow tour. Of course, there's always the possiblity that the other women could be fitter and faster than guys but I only know one other gnar female tourer - and she's married to a mountain guide. So I was lulled into thinking it would be a 'sortie cool' as the CAF call the sort of tour that's not steep, icy and adrenaline fueled. It was a classic blue sky ski touring morning. But the thermometer was rising rapidly. It was already hitting 6C at 8am parked up on the Granon road at 2000m. When Ken drove up to our van my heart sank a little as only three guys got out. No wives. I then spotted an ice axe on Richard's backpack. 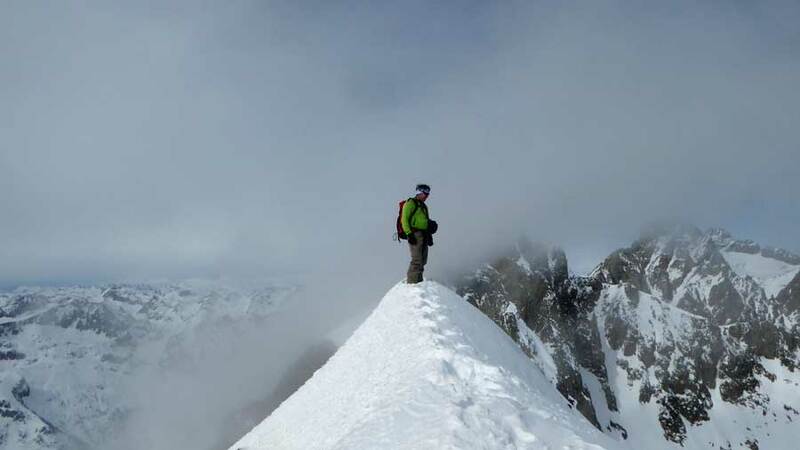 It soon became apparent that the plan was to go a new route, high and along a ridge where it 'might' be icy requiring ice axes and boot crampons. None of which we had with us. And which,actually, I don't even own. So Gav and I bailed, erring on the side of safety and, also, knowing that being exposed on a ridge is not my favourite place on earth. 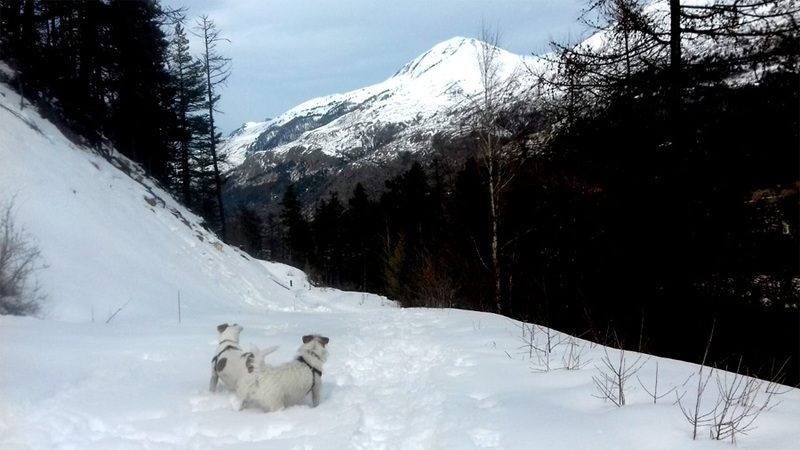 Plus we had the Rando Chiens with us. So we skinned up 600m, instead, a total of 4K climbing to the far less exposed ridge of the Crete de Cristol. 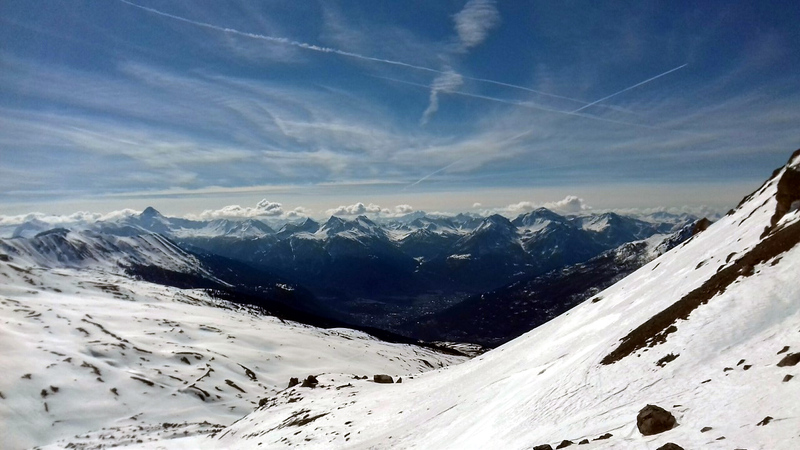 We had the amazing dual view - south to the pistes of Serre Chevalier and north to Nevache. 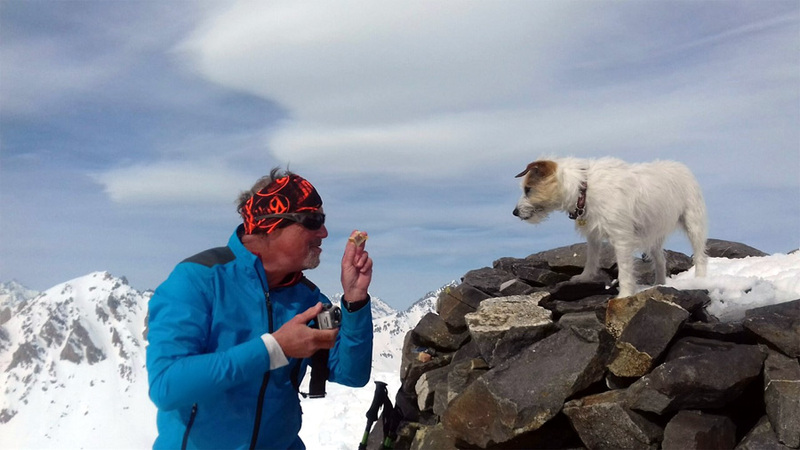 After a short break enjoying the absolute peace of the mountains, warm spring sunshine and sharing pate en croute with the Rando Chiens, we skied down to the sweet sound of shifting sugar snow, steeper at the top but easy turning all the way back to the road. Lazarus has risen. After a week nursing an infected ankle, Gav decided to don ski boots and go touring. The reason is that he's had his boots 'remodelled' by Benoit Dran of Feet & Fit in Briancon and can now wear them without pain. The Rando Chiens barked Halleluyah, we're back on tour. Except this morning dawned with blue sky and some high cloud, then got progressively worse turning into more of a greybird day. We were half way up one of our favourite ski touring routes when the weather closed in and the wind whipped down from the peaks. It was also keeping the snow hard and icy on long traverses, which didn't help Gav's ankle or my vertigo. So we called it a day and skied down in flat light and what was surprisingly good spring snow. The mercury's rising here in Serre Che and in most of the Alps. But percipitation is due sometime at the end of next week but rain or snow? Fingers crossed the temperatures drop enough for more of the white stuff. Gav's been back nearly a week from the epic ski tour of the Alpes Maritimes and still can't put on a ski boot. 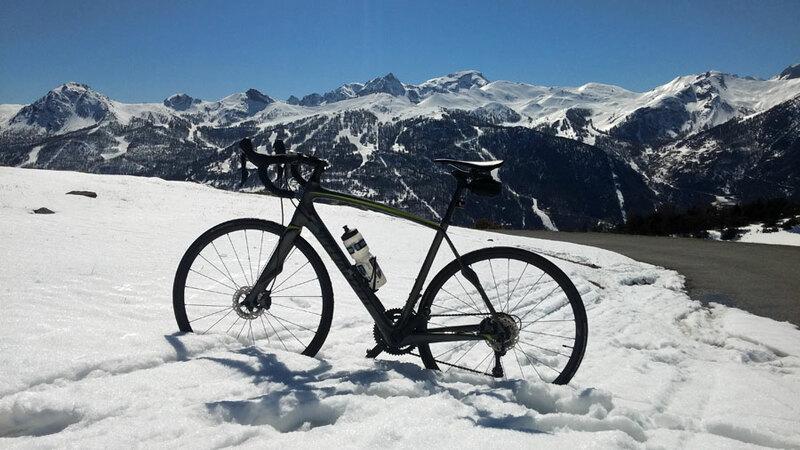 If you've got five minutes, grab a coffee, read his Tour Guide report and catch some of the breathtaking pics from the Alpes Maritimes Mercantour ski randonnee tour . 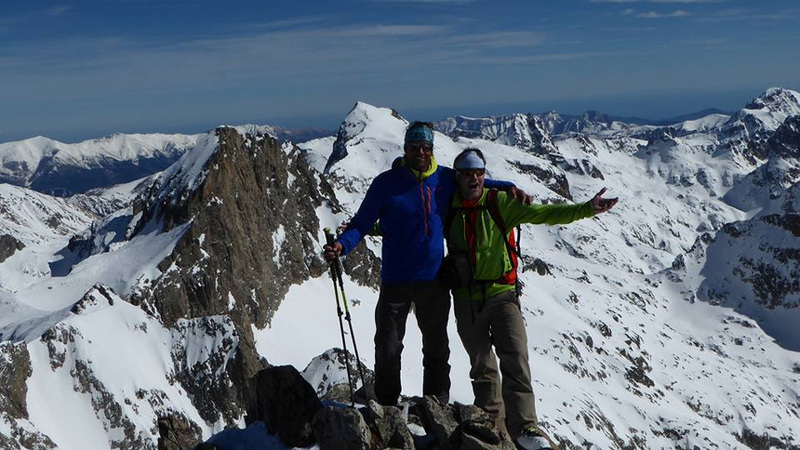 Gavin is working on his report on the Southern Alps tour, which even the tour maestro mountain guide Per As (below with Kris Erikson, below) has described as, 'One of the best ski tours ever'. It was First Lifts Friday because we needed to do Manchester. 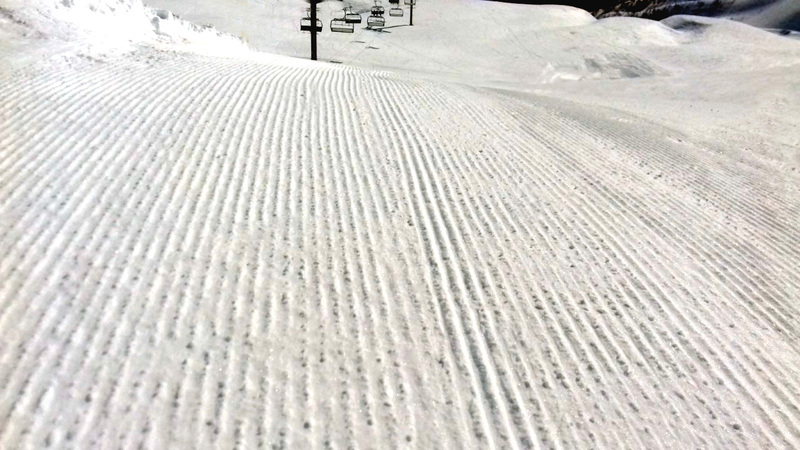 This is what we've heard Swedish skiers call the newly pisted slopes that the Americans call Groomers and we call Corduroy. Why Manchester? Because this is what they call corduroy in Sweden as it was obviously made there at some stage in fabric history and the Swedes wore Manchester trousers. Today is sunny and super warm. It was 9C at 7.30am so back by midday as Manchester was becoming Velcro, which freakily was made in Manchester New Hampshire when Velco USA was first launched in 1957. It's 15C on our patio at 12 noon with a warm hairdryer wind blowing up the valley. The south facing snow is disppearing quicker than ice cream off a hot spoon. Gav and the South Alps grand tourers are now at the Refuge de Nice where they actually have the luxury of hot water and electricity. 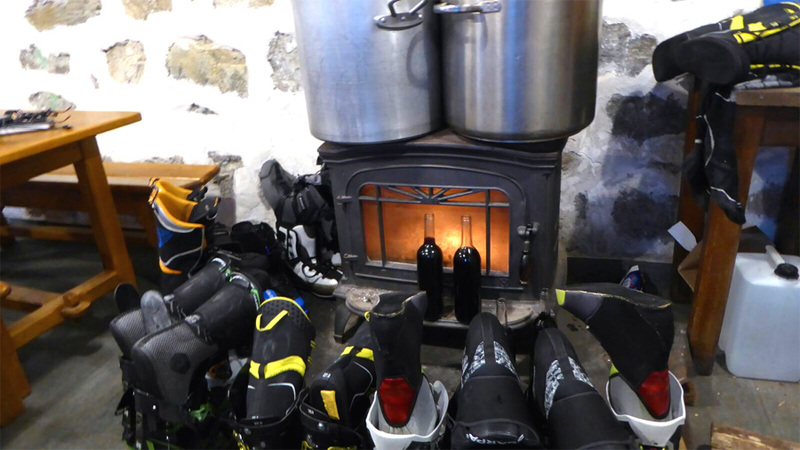 Also, a wood burner for warming boots at the end of the day and the essential bottle or two of vin rouge. With a bluebird day forecast, I was up on the first lifts today, and had the Cret drag area all to myself. Off at the top it was perfect powder, so perfect that I had to do it five times - see my mountain etchings (image, below)! Temperatures have risen from -7C at 8am to 12C at 2.30pm on our patio, so all south facing snow is turning to slush. Back to ski touring soon. Meanwhile, Gav is somewhere south of Isola 2000 and north of Nice, climbing up around 1000m a day. So it's skiing with views of the Med in the background or the top of a drag lift? I guess Gav wins! So doing knee high powder in a white out here in Serre Che or climbing in the spring snow and sunshine south of Isola 2000? Which would you rather? Whichever you chose you'd still suffer from FOMO - Fear Of Missing Out. 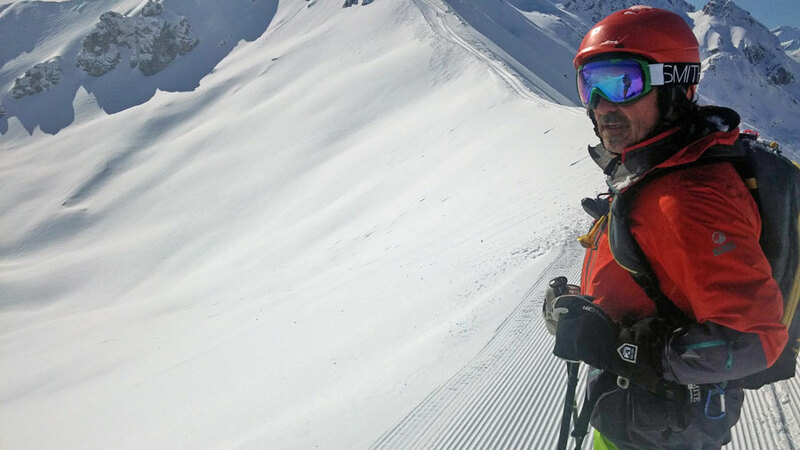 Gav on the Southern Alps grand ski tour is fearing that he's missing out on our powder while we wouldn't mind some sunny skies and that end of day elation after a 1000m climb. 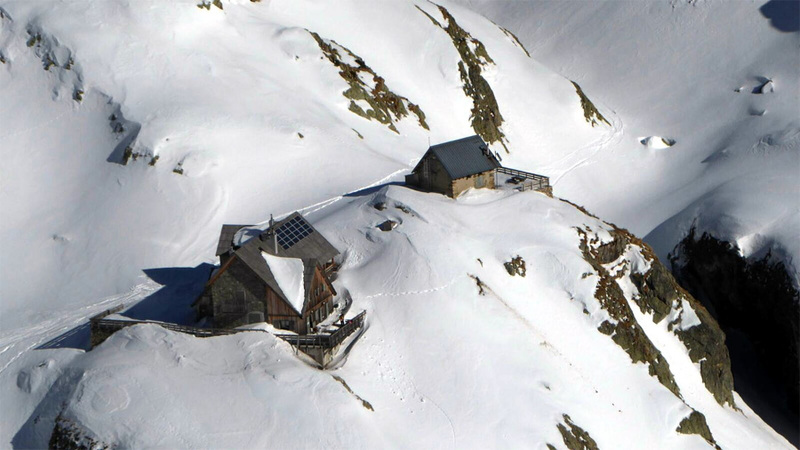 However, they don't have any electricity or water at the Chalet de la Madone de Fenestre where they are staying so no FOMO from me there. It snowed last night and continued all day with low grey cloud hovering over the valley. So the storm riders had the powder to themselves up the hill. But with top lifts closed and loaded snow - plus a news report from Le Dauphine that two were caught in a avalanche here in the Aiguillette sector in Serre Che yesterday - it meant mostly sticking to the trees. The report I have from our resident storm warrior and photographer, Pike (who took the image, below) is that there were at least 40-50cms of fresh. So up to knees in powder. It's still snowing at 17.30 with much more due overnight. As Pike says, 'Happy days'. We had 20+cms of fresh, this morning, and some sunshine making it a perfect Sunday shred of the sidecountry off the lifts. By 1pm the usual stashes, even the secret ones, were chopped and an hour later the weather came in bringing more snow. So it was home to walk the Rando Chiens. 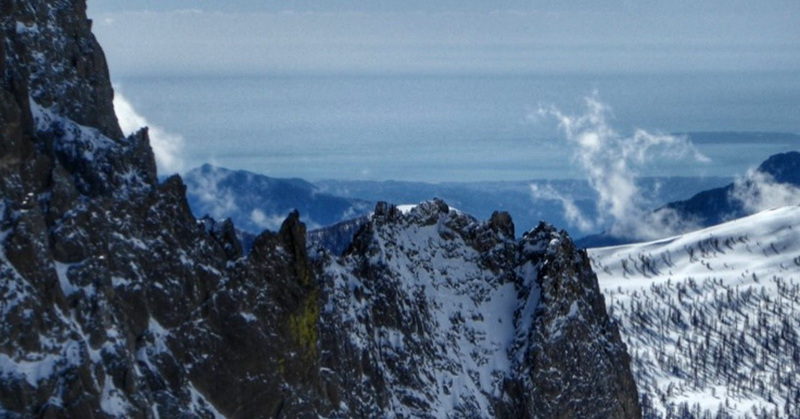 Meanwhile, Gav is on the Southern Alps tour where the only lifts are on the back of his Dynafits. 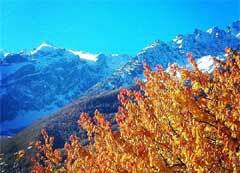 They are staying at the Gite du Boreon at Vesuble in the Parc National du Mercantour. After a cosy night - five guys in one room - they set off at 8am for a day's tour. It was a long hike up through the trees to put the skins on. They ended up climbing 1500m vertical to Cima Ghilie right on the French/Italian border at 2998m. They certainly had to earn those turns. But they were rewarded with an amazing view. You could see the Med from up there (below). For the descent, the cloud rolled in, hence no skiing pics. And they also paid for their turns with a run out that was 'rather tough'. Then they have tonight's sleeping in close quarters to look forward to while I have a double bed all to myself (except for two snoring Rando Chiens). And so the spring tour of the Southern Alps begins. Today Gav left driving to Isola 2000 to complete a traverse down the Alps that mountain guide Per As started 10 years ago. The plan is for a 5 day hut-to-hut tour from Isola ending on the beach in Nice. He'll send dispatches from the snow front that I'll upload here on the blog. 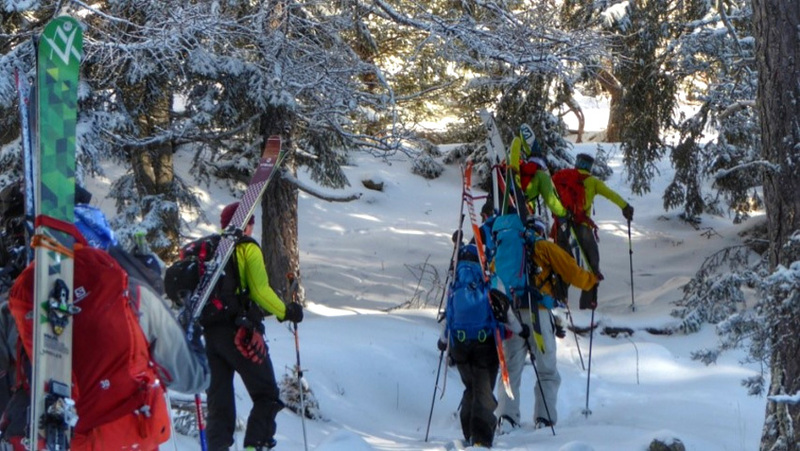 Meanwhile, yesterday, La Grave was closed again so Gav and some of the Isola group skied here, doing the fairly mobbed Montagnole and Cucumelle classic off piste routes. I donned trainers and took the Rando Chiens for a 4 mile run up towards Frejus in the mud, slush and snow. This morning there's a snow storm here in Serre Che (see webcam) with more to come this week. 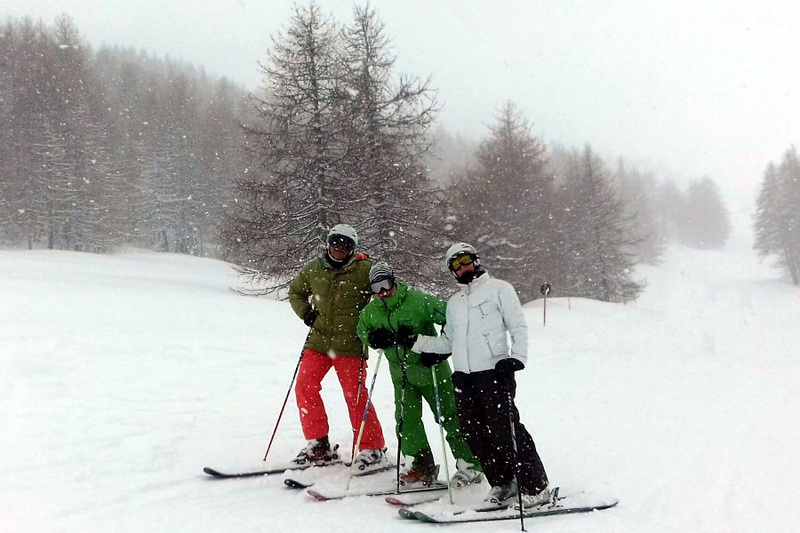 So, yes, Courmayeur, did have a metre of new snow, yesterday, but new snow can be a Heuristic Trap, the fatal trap of Scarcity (read more here). Everyone gets so excited to be out there to make turns in the fresh powder. that there can be human error that creates an avalanche. 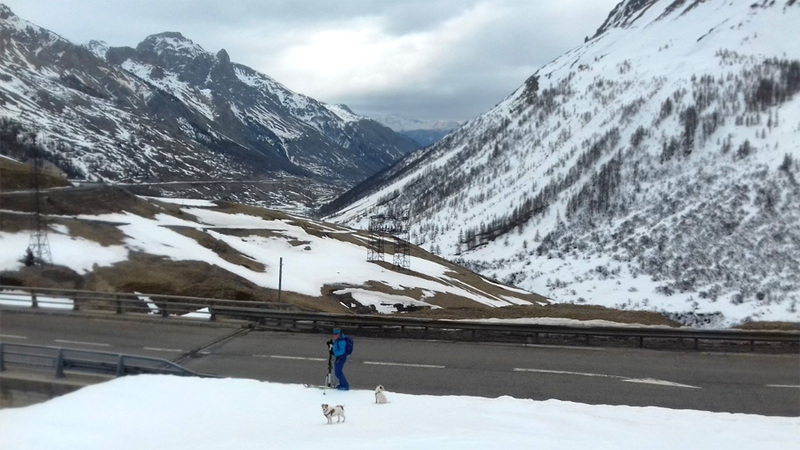 So sadly, there were three fatalities in the Val Veny near Courmayeur, today, where off piste groups comprising 18 mixed nationality skiers were involved. 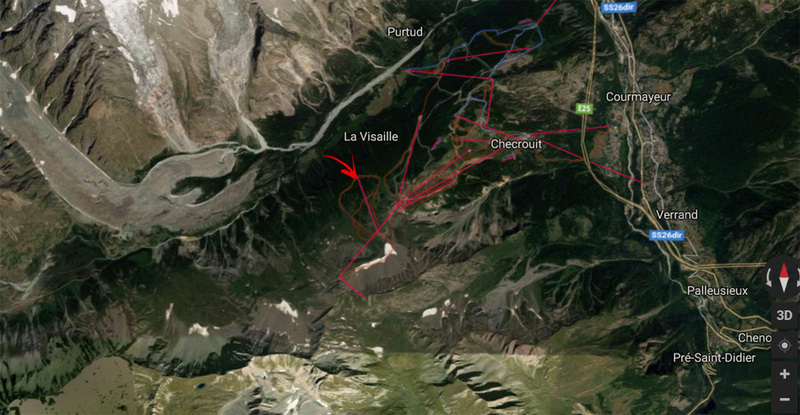 The avalanche victims in the section of Plan de la Grabba, were Italian, Belgium and German. 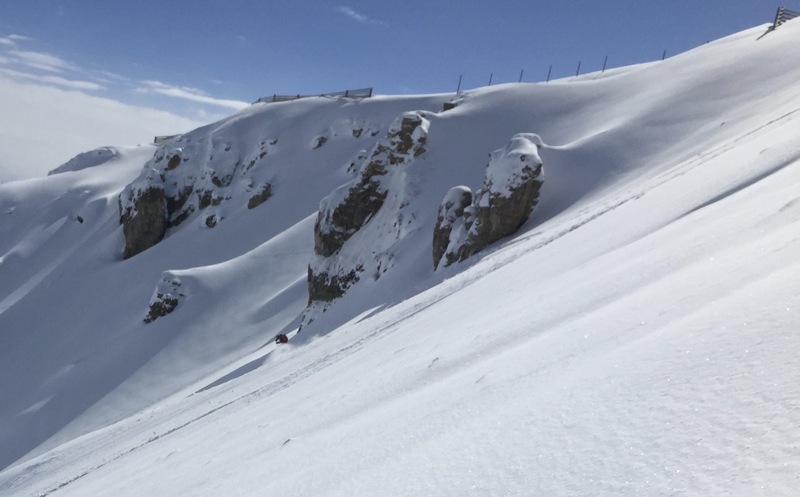 Another five freeriders were injured, with three still being treated in hospital. Certainly there was some human error that caused it. Gavin went over to La Grave today and was there early before the lift opened with many others. News came through that the lift would not be opened above P2. 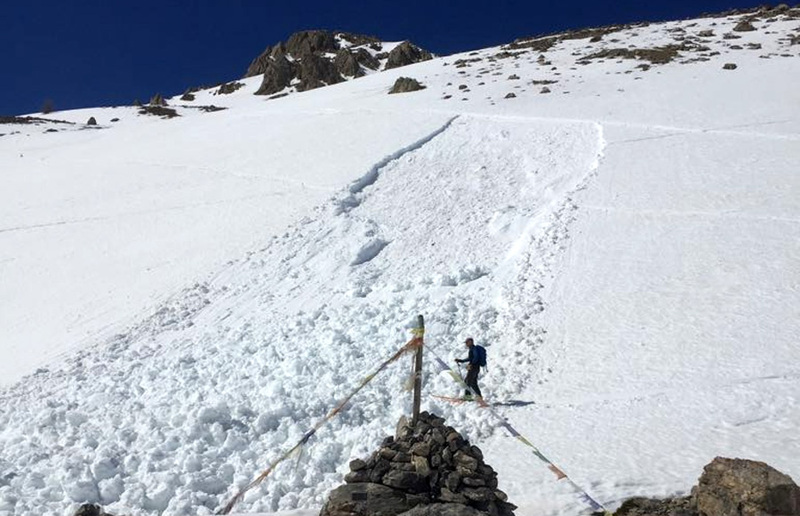 However, when the mountain guides returned from the commission run, which is carried out to determine conditions, it transpired that one of the guides was caught in a big slab avalanche and fortunately managed to trigger his airbag. 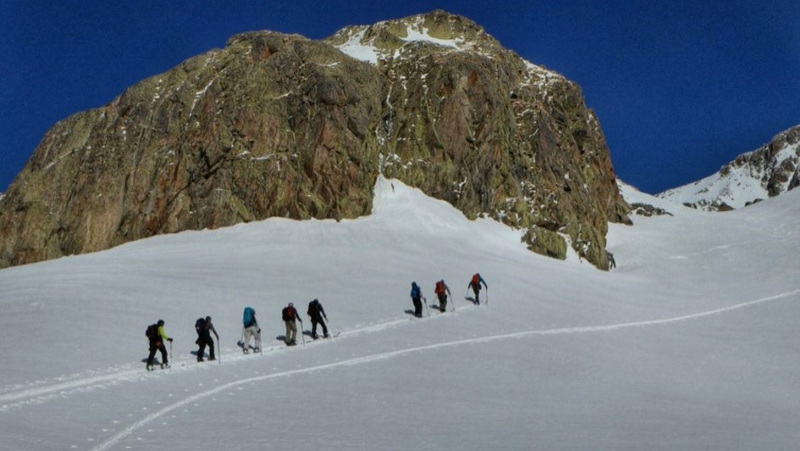 The remaining guides above him were able to get to him and find his lost ski but not his poles. As one guide said afterwards, that was a first in the history of the commission run. In the ultimate freerider backcountry that is La Grave where there is no official avalanche control (as in blasting) it was a significant safety decision. After that incident there was no way that they could open the lift even below P2. When I said, yesterday, what's not to like about March? I guess the answer is, the unpredictable snowpack that's often created by the warm spring temperatures. We drove back from Morzine, yesterday, through varying amounts of falling percipitation. It was raining in Morzine, heavy snow on the Italian side of the Mont Blanc tunnel reducing towards Montgenevre. Back in Serre Che it snowed for most of the afternoon, stopped overnight and was falling lightly this morning with cloud clearing by 10.30am. 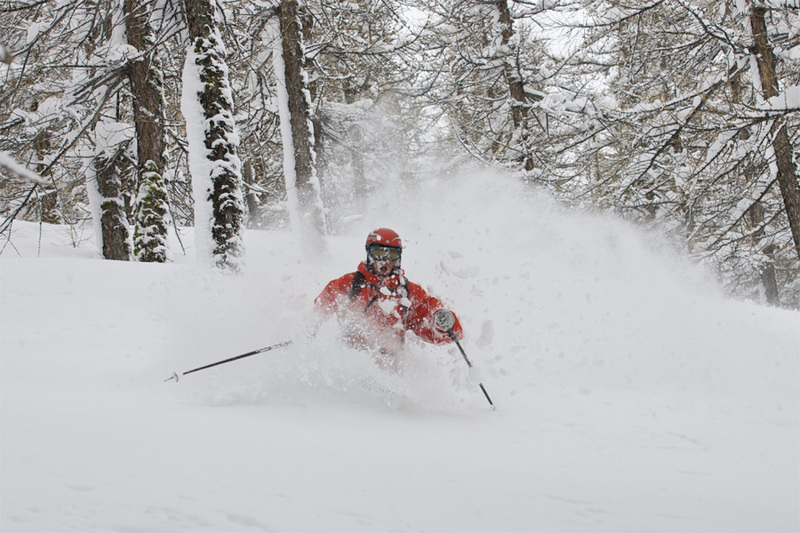 So Courmayeur may have had around a metre of fresh while we have 30cms max. But it's better than nothing. 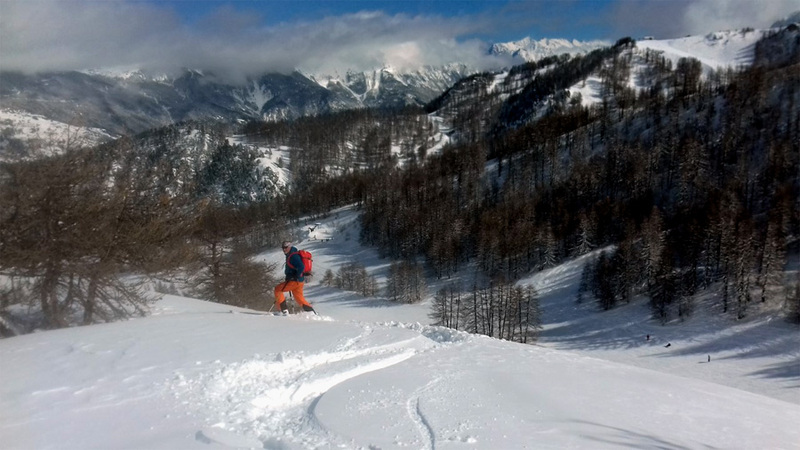 In fact, we had a powder shredding morning with one pretty amazing run down from the top of La Balme after boot packing it along the very windy ridge from the Vallon chair for 20 minutes. Yes, there are still families here for the last of the half term weeks. But there are hardly any queues. Fresh snow, fewer people, warmer temperatures. What's not to like about March? Backcountry, Out of Bounds or just lost in Steamboat? Ski and snowboard magazine for skiing and snowboarding news, ski blog, ski and snowboard gear reviews, features with an edge (or two) plus ski touring guide . Advertise with us to reach your target audience and become a STYLE PARTNER.